This is the MMOne. It’s a “3-axis virtual-reality gaming chair.” And it might make you barf. I know it would make me. Just watching this clip is making me woozy. According to its official site, the chair is compatible with gamepads, joysticks, and the Oculus Rift. 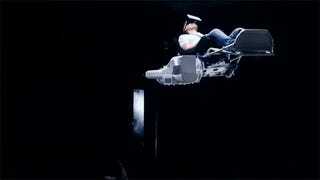 There are also roller coaster and space sims for people to experience as virtual rides. The MMOne is suitable for people over 12 years old, between 3.6 feet and 6.5 feet tall and under 260 pounds. Eurogamer reports that the still-in-development chair isn’t yet available for purchase. Or, I guess, puking.